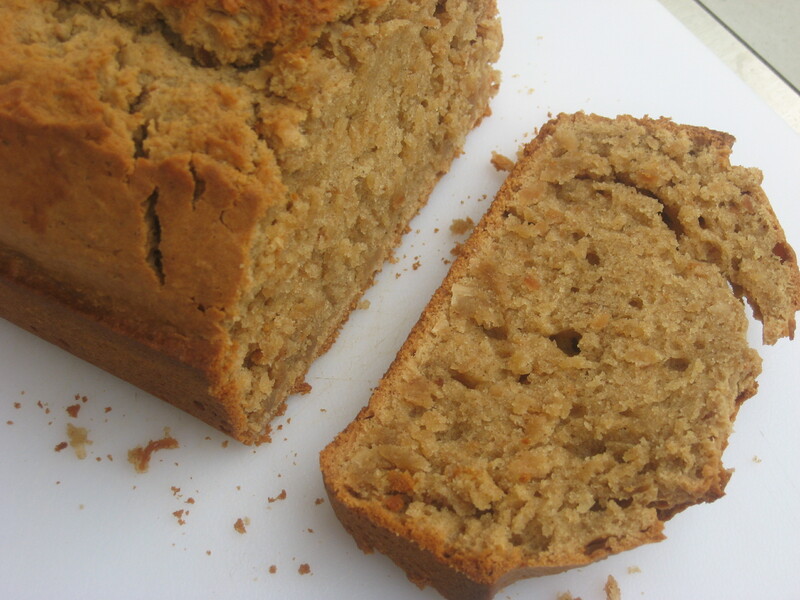 If you love coconut you will absolutely love this moist and delicious coconut quick bread. If you like coconut, you will absolutely love this moist and delicious coconut quick bread. There are many food blogs I love to visit that are both mouth-watering and inspiring. One of these blogs is from Kathy at Polwig. If you aren’t sure what Polwig means, check out Kathy’s blog and she will tell you. It’s a brilliant choice for the description of her blog, which features both cooking and raising children. There is something for everyone, so give her blog a visit. You won’t be disappointed. When I was reading her blog a few weeks ago I came across a photo of this Coconut Quick Bread and could not get that recipe out of my brain. Finally, I made this bread this other day and was not at all disappointed. It lived up to the mouth-watering picture and turned out easy, perfect, moist and dense. I’m not going to give you the recipe here, but I will give you the link to Kathy’s site and you can check out how to make this Coconut Bread for yourself. I will tell you the few changes I made. The recipe originally called for vanilla extract, but I had a bottle of coconut extract so I used that instead. I also had some pecans just waiting to be used in something, and since I’m a nut for nuts, I added about a 1/2 cup of chopped pecans. Perfection. I do have one suggestion when you toast the coconut for this bread. Actually, two suggestions. The first one is don’t even think about leaving the oven when you do this. It goes from toasted to burnt in mere seconds. Literally. I opened the oven, checked and figured it could go just a “bit” more. I opened the oven 30 seconds later and it was black and burnt to a crisp. Luckily I had enough coconut to toast a second batch. This batch I actually stood right next to the oven the entire time turning it and watching it closely. The second suggestion would be to toast a little extra coconut. If you are like me you will be eating some of this goodness right out of the oven and wanting to make sure you still have enough for the recipe. I could have eaten a bowl of just toasted coconut and nothing else. Consider yourself warned. This would be a great bread to make for the holidays and package up for gifts. It’s something different when you think of the typical Banana Nut or Zucchini quick breads. Which are both equally delicious as well, but the coconut puts a completely different twist on things and makes for something out of the ordinary. Try it! We truly enjoyed it! Thanks, Kathy for sharing a great recipe! I can only just imagine how good macadamia nuts with be in this bread. Or anything else! Thanks for visiting and I will check out your blog. Looks so yummy! I am the only one in the house that likes coconut but I am going to make this just for me!!! All the more reason to make this. More for you! Thank you so much for posting this you are wonderfull. BTW I am not sure if I ever explain it on my blog but Polwig is a Pollywag or Tadpole. I think the only time I do explain it is when I talk about trying to raise tadpoles to frogs with my kids (we didn’t do a good job btw). Come to think of it I should probably put a description somewhere in there. You are more than welcome! I loved this recipe! And you do explain what a Polwig is. It’s in the upper right hand corner of the Home page of your blog. That’s how I knew what it was! LOL I love the idea of it.